Mmmm….yummy, lightning fast and VERY kid-friendly. Inspired by a recipe that was originally in Good Housekeeping and then adapted by my friend Barb, and then adapted again by me. The original version can be found here. For adults, you may want to doll this up a bit: a little sriracha for a tad more “kick” and maybe a handful of cilantro leaves at the very end. Cook rice in the chicken stock, according to the package directions. While rice cooks, heat sesame and peanut oil in a large skillet over medium high heat. Add garlic and pork slices and cook for about 6 minutes, or until pork is browned on the outside and no longer pink in the middle. While pork cooks, stir together the cornstarch and water in a small bowl until the slurry is smooth. Stir together soy sauce, vinegar, ginger, molasses, chile paste) in another small bowl. 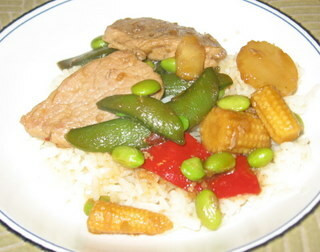 When pork is almost done, pour the soy sauce mixture and vegetables into the skillet and continue to cook for about 4 more minutes, or until the veggies are done, stirring frequently. Add cornstarch-water mixture and cook about 1 more minute, or until sauce has thickened. Remove from heat and serve over the cooked rice. Tonight’s dinner is adapted from this Epicurious/Bon Appetit recipe. I substituted Baby Bam for the mustard (Boy and Girl aren’t fans) and added green pepper, bay leaf and garlic and cut the amount of onion a bit. The verdict: this was okay, but I think I’ve concluded that I just don’t like cornish hens: they’re a lot of trouble to prepare and to eat, with all of those bones and skin, and it’s hard to make them flavorful, since it’s hard to get seasoning deep into the meat. If I make this again, I would probably use boneless, skinless chicken breasts that have been marinated with something instead of hens. As some commenters on epicurious said, the stuffing was a little sweet, because I used the Jiffy mix, which does have some sugar in it. It didn’t bother me enough, though, that I would make cornbread from scratch for a weeknight to make this stuffing (I only do that for Thanksgiving). Heat oil in a heavy, medium skillet over medium heat. Add onion, garlic, celery, bell pepper and bay leaf; saute until onion is translucent and other veggies have softened, about 5 minutes. Mix in ham, sage, parsley and enough chicken broth to moisten the stuffing, but not make it soggy; stir until heated through. Remove skillet from heat. Season stuffing with 1 tsp. of the Baby Bam seasoning. Cool slightly. Preheat oven to 375 degrees. Grease a 13 X 9 X 2 baking dish and place the stuffing in the dish, in 4 separate “piles” or mounds (remove bay leaf pieces, if you can find them). 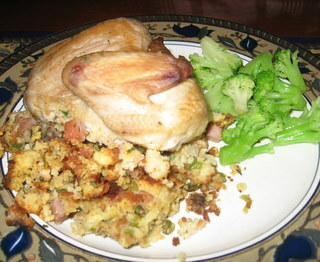 Season hens with remaining Baby Bam seasoning and set one hen half on each stuffing pile. 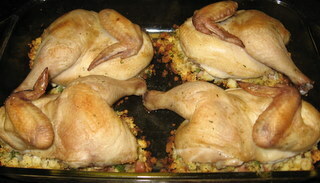 Roast hens until golden brown and juices run clear when thighs are pierced, about 45 or 50 minutes. Transfer hens to platter and serve. 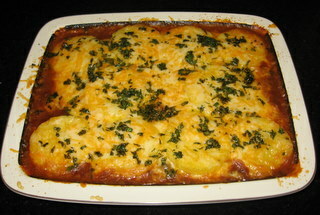 Tonight’s dinner was adapted significantly from this recipe in the September 2007 issue of Cooking Light magazine. A huge hit with all of us. We’ve had our first wave of chilly fall weather this week, and this was the perfect warming dish. YUM. Blot chicken breasts dry with a paper towel. Sprinkle them with 1 tsp. of the Baby Bam seasoning and grill them. Let them cool slightly and then cut them into bite-sized pieces (or slices) and set aside. Bring broth to a simmer in a medium saucepan (do not boil). Keep warm. Heat 1 Tbsp. of the olive oil in a large saucepan over medium-high heat. Add leek to pan; saute 3 minutes or until tender. Add rice; cook 2 minutes, stirring constantly. Stir in wine, and cook 1 minute or until liquid is nearly absorbed, stirring constantly. Stir in 1 cup broth; cook 5 minutes or until liquid is nearly absorbed, stirring constantly. Reduce heat to medium. Add remaining broth, 1/2 cup at a time, stirring constantly until each portion of broth is absorbed before adding the next (about 25 minutes total). About halfway through (after about 2 more cups have been absorbed, after the initial first cup), stir in the chicken pieces and the spinach, a little bit at a time to maintain a constant temperature. After rice is cooked and tender (the only way to really decide is to taste it with a clean spoon), stir in half-and-half and pepper; cook 2 additional minutes. Remove from heat; stir in tomatoes, basil, remaining 1/2 tsp. of Baby Bam and cheese. 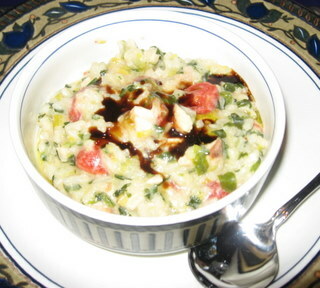 Spoon about 1 cup risotto into each serving bowl and drizzle each bowl with 1/2 tsp olive oil and 1/2 tsp balsamic glaze. Another option: Prepare the risotto without adding the chicken and then add the chicken slices, in a decorative fan pattern, on top of the risotto. We got “Boo’d” last night. I’ve always heard of “Boo’ing”, but we’ve never been “Boo’d” before, and, I have to admit, I always felt a little left out. For those of you that don’t know, this is a Halloween tradition that is popular in the suburbs. It entails delivering a little bag of candy and treats to the house of a neighbor, after dark so that you won’t be seen and a poetic request that you “Boo” two other neighbors. There is a little ghost decoration attached that is meant to be hung in one of your front windows so that everyone knows that you’ve already been “Boo’d” and they shouldn’t target you again. Here’s the thing, though: I’ve always wanted to be “Boo’d” and knew almost instantly what was happening when someone rang our doorbell last night and no one was there when we went to the door. Hubby, on the other hand, was his usual curmudgeonly, cynical former police officer self and was convinced that we were about to be the targets of some horrible vandalism. He went around the house, turning on all of our exterior security lights and looking for teenagers with eggs or shaving cream. It was really hard for me not to laugh. I might have actually laughed, just a little bit, really really quietly. In his defense, in the three years that we’ve lived here, our cars have been shot up with paintballs and broken into three separate times. Sigh. I digress. Anyway, this recipe is adapted from a really old Halloween party book – so old that the cereal that it called for isn’t even made anymore, so I had to make a substitution. I thought it would be great to put in the “Boo” treat bags, along with some candy. Heat oven to 350 degrees. Grease bottom of a 13 X 9 inch baking pan. In a medium bowl, combine the brownie mix, eggs, oil and water; stir until well blended. Spread in bottom of greased pan. Bake at 350 degrees for 25 – 28 minutes, or until toothpick inserted 2 inches from the side of the pan comes out almost clean. Remove pan from oven. Immediately sprinkle marshmallows evenly over warm brownies. Return to oven and bake an additional 1 or 2 minutes or until marshmallows just begin to puff up. 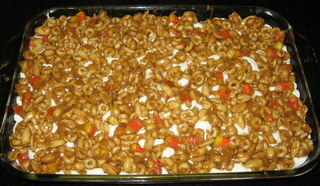 Remove from oven and set aside to cool while preparing peanut butter topping. In a large saucepan, combine brown sugar and corn syrup; blend well. Cook over medium heat until mixture comes to a boil, stirring constantly. Remove from heat. Stir in peanut butter until well blended. 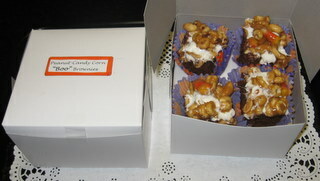 Add cereal, peanuts and candy corn; mix well. Immediately spoon warm topping over marshmallows and spread to cover (work FAST because this stuff hardens quickly). Cool for at least 1 1/2 hours or until completely cool. Cut into squares. Makes 36 bars. Addendum: I tasted one of these as I was packing them up into the boxes and they were definitely festive and interesting and will definitely be kid-friendly (we’re not sure which house we’re “Boo’ing” yet – we had plans last night and weren’t home to pick a “victim”, so we’ll do it tonight), but they were a tad salty. All in all, I think there’s nothing wrong with just plain-old brownies. I hope that the neighbors will think these are fun, though. Mix the marinade ingredients together and pour over chicken in a sealable plastic container. Refrigerate for 4 hours, shaking or stirring about once an hour, if possible. While chicken is marinating, soak skewers in water in a plastic bag or another plastic container (this will keep them from burning later). 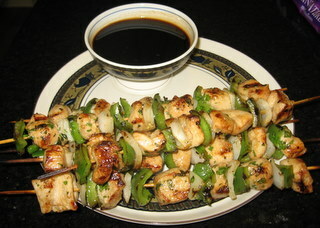 After 4 hours, remove chicken from marinade and skewers from water. Thread chicken on the skewers, alternating with the onion and peppers. Set aside while you start to prepare the dipping sauce: combine ingredients in a small, heavy saucepan and bring to a gentle boil. Lower heat and simmer for 15 minutes. While sauce simmers, grill kebabs until chicken is cooked through. 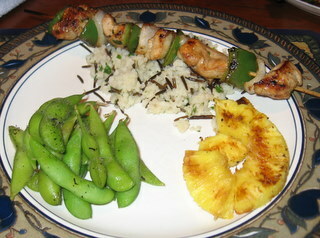 Serve on a bed of rice with grilled pineapple and Edamame with Smoky Salt (flavored with lapsang souchong tea). You may put the pineapple on the skewers, if you prefer, but Hubby’s not a big pineapple fan, so I served mine on the side. Once they tasted it, however, they were won over. I sprinkled a bit of Baby Bam on the chicken before adding it. I wasn’t kidding when I said that I use that stuff on everything! I added a tiny bit (1/2 tsp.?) of chili powder with the other spices. I used 2 fresh, pressed garlic cloves (add with the onions) instead of the garlic powder and about 3 Tbsp. fresh, finely chopped cilantro instead of the dried cilantro leaves. I added about 1/2 cup coarsely chopped baby carrots (I had them in the fridge) and about 1/2 cup pre-cooked green beans (leftover from last night’s dinner). This turned it into more of a stew than a chili. I don’t like using the “caldo” (the liquid that comes in canned beans), because it’s very high in sodium, so I drained and rinsed them and used a chicken stock (1 additional cup) and corn starch (about 3 tsp.) slurry, instead, to give the “chili” some thickening. I used cheddar, instead of monterey jack cheese, because that was what I had on hand. Pepper-Jack would have been even better. 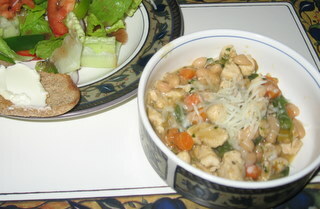 The only thing that I would do differently (and I should have known better), if I make this again, would be to pat the chicken dry before adding it to the pan. There was a lot of “juice” on it (I had cut it up and refrigerated it early in the day, to make the prep faster at dinnertime) and the pan wasn’t very hot, so the chicken was more braised than browned. It would have been better with a little “sear” on it. I served this with a salad (romaine hearts, bell pepper, tomato, purple onion and balsamic vinaigrette) and some Great Harvest bread with butter. I big hit with everyone; both of the kids said that they really liked it. I made this once before, MANY years ago and kind of forgot about it, but I had a bunch of leftover Chex cereal in the house from making the “Texas Trash” and decided to give this another go. The last time I made it, the recipe on the back of the Chex box called it “Puppy Chow” (I think that they could get away with this because I think Ralston Purina owned Chex? 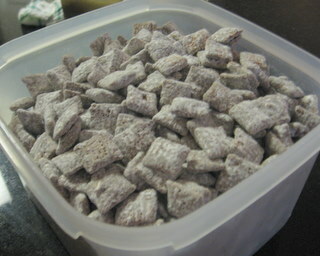 ), but now they are calling it “Muddy Buddies” (recipe here). I think Puppy Chow sounds cuter (and it does LOOK like Puppy Chow), but I know, I know….copyright this, trademark that, registered name, blah, blah….. This was a SUPER huge hit with Boy (who helped make it) and Hubby, but Girl (who detests peanut butter) would only give it a tiny little taste before gagging and spitting it out (oh, well….more for us). I have to admit that I wasn’t expecting much when I first saw this recipe: I thought it would be kid-friendly and easy, but wasn’t expecting it to be terribly tasty or sophisticated. I must say, I was pleasantly surprised. The funny thing is that this ACTUALLY TASTED a bit like tamales. It was sort of an upscale version of Frito Pie, but much better and it was ridiculously easy to whip up. 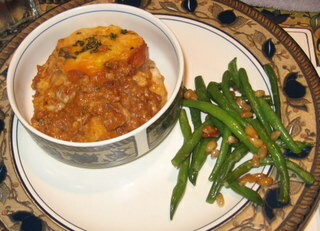 We served it with the leftover green beans from last night. This was a big hit with all four of us. If I do it again, I might break up the polenta and make it into more of a “paste” so that I can spread it into two layers, rather than having the “rounds” of polenta, which made the dish a little difficult to cut/portion/serve.